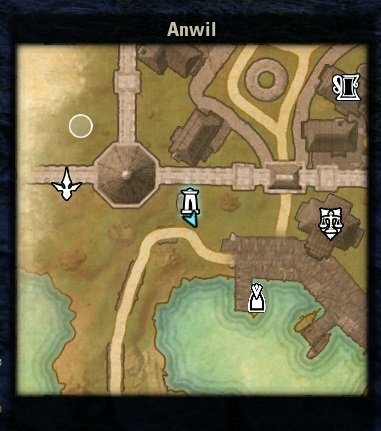 This addon reactivates the mini map from ZOS. Thus the mini map does not do less, but also not more than the built-in world map, because it is the built-in world map. No artificial synchronization of (custom) pins between mini map and world map. All kind of pins are supported by design. But also no border pins or rotation mode and such features. My mini map is intended to be lightweight and fast. Includes world map performance tweaks, which can be disabled for performance comparison. The tweaks changing the pin rendering to utilize the CPU up to a framerate of 75 only. Seeing the pins rendered over time is not a sign of overload of this addon, but a compensation of others. Conflicts with other mini maps can be expected. Therefore the mini map can be disabled to use the tweaks only. I do not recommend to use the AUI mini map module at the same time as mine. Positioning and resizing in keyboard mode only. If you think you need a full-featured mini map try the MiniMap by Fyrakin. @Shinni did a great job creating a plug-in for a Circular Votan's Mini Map. And if you want to show group pins in different colors and/or icons, such as showing a different color for dead players, you may want to use Votan's Group Pins. The addon works well for me. Otherwise I would not have released it. If you think you have performance problems due to this addon, help tracking down or stop using. Frame freezes are most likely coming from an addon providing a lot of pins without taking care about creating even a simple pin takes some time multiplied by hundreds. In this case the author of that addon can make it more mini map friendly, only. There are key-bindings to toggle the mini map on/off. For technical reasons the toggle while at siege weapons needs its own key-binding. But you can re-use the same key. In order to move or resize the window, you need to go to the mouse-cursor mode. You can do this by pressing the key-bind for mouse-cursor mode, which is "." (dot) by default. Or you press "Enter" as if you want to start chatting. - Try to enable tooltips: Update: Found a real, real hacky way. Gamepad mode is wonky. One has really have to think about going this way. - New option: Asynchronous Update is optional, now. Try it. - Allow to fix Mini Map at current mouse pointer position like setting a waypoint. - Tweaked dead-zone handling of the zone/sub-zone toggling. - new option: Show Full Title. As requested by @mav1234. - Fixed gamepad levels buttons. - The fix of 1.4.10 introduced a new bug, that sometimes the mini map stops following the player pin. - The fix of 1.4.10 introduced a new bug, that does not allow to hide the mini map once the world map was shown. - Fixed leaving fast travel mode on dismounting. Thanks to @Jhenox. - Fixed overseen change to POIs. - Update to LibAsync rev 1.8. - Fixed mini map keeps stuck in drag-scroll mode. - Added russian translation. Thanks to KiriX. - Improved support for language-packs. Thanks to TERAB1T. - New option: Keep Square. 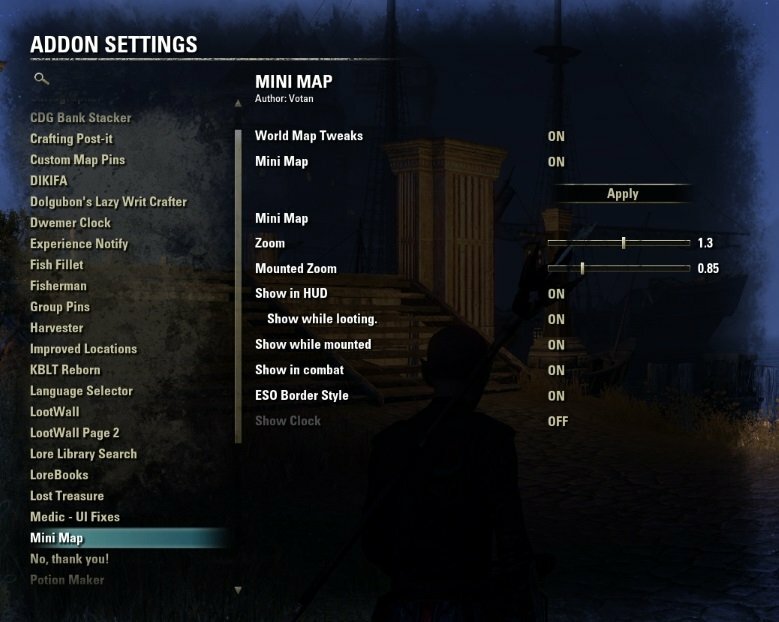 Finally found a way to change ZOS' pan&zoom for retangluar mini maps. version 1.4.4: Fixed dependency typo, which prevents addon gets loaded. - Update to LibAsync rev 1.7. - New behavior: Mounted Zoom is a scale factor, now. You may need to re-adjust this value to your preferences. - Fixed bug which would cause trouble with WaypointIt. - Store zoom factors scale and limitedScale in VOTANS_MINIMAP. Requested by Shinni. - Fixed fast travel to "The Harborage". - Fixed settings reset to default. - Added LibQuickPin for faster pins drawing in World Map and Minimap. Thanks to @Shinni. - All settings, expect toggle state, account-wide: Zoom key-binds did use wrong settings. - Fixed icon size scaling. - Hopefully fixed the Cyrodiil zone caption update. Part 3. - Fixed "Show while Mounted". - Hopefully fixed the Cyrodiil zone caption update. Part 2. - Update to LibAsync rev 1.6: Take cake of V-Sync on/off. For V-Sync on, the target frame rate is bit higher than 60fps. For V-Sync off, the frame limiter value (default 100fps) is used for target frame rate. - All settings, except toggle state, account-wide. - Fixed wrong pins. Part 2. - Hopefully fixed the Cyrodiil zone caption update. - Hopefully fixed hooking pins. Like "Hide Preview Houses". - Update to LibAsync rev. 1.5. - Allow to set a waypoint with ctrl left-click in minimap. - Renamed from "Mini Map" to "Minimap" for better addon search results. - Fixed an issue with map change ping pong in some sub zones at the edges. - Adding a deadzone to sub-zone map swapping. - Hopefully better "Show On Mounted" key-bind toggling. - Prevent "Joviex's Addon Settings Transfer (Updated)" false detects the addon as settings useable for transfer. - Update for "Horns of the Reach". - Layer mini map under bounty meter. - Zoom key-bindings at siege. - Fixed a typo for settings tooltip. - New option for title at the bottom bar. - LibAsync 1.4: Boost mode for menu scenes. The boost mode shifts the priority from framerate to Lua speed. - Fixed Show Siege settings. - Fixed Mounted Zoom factor settings. - Zoom factors and show states are per character, now. But taking over former account-wide settings. I did not expect that to be so important. Sorry. * If the character was not loaded before already. - Update to LibASync 1.3. - Zoom factors and show states are per character, now. - update to LibAsync 1.2: Low framerate mode, fix bug in Delay. - Fix potential issue with detecting LibGPS. - New option to show/hide compass, if mini map is shown on HUD. - LibAsync rev 1.1: New target framerate 75. - Back to render method of v1.1.0 with new LibAsync. - Fixed missing map update for Cyrodiil specific pins. - Added debug option to show frame freeze warning. - Reverted rendering tweaks, which could make the addon "heavier". - Better support for LibGPS. - Limited gamepad support. Thanks to @Shinni. * Limitation: Positioning and resizing can be done in keyboard mode only. - New option to suppress Zone change annoucement in upper right corner. - Use LibAsync for asynchronous programming. - New option: time format. - Added optional dependency to TrueExploration for compatibility. - Fixed another small issue with "Show on Map". - New option to choose either or not to zoom to player. - Fixed pins were keeping mouse-over-size. - Better unsupport of gamepad mode: World map is not broken, if switching to gamepad mode. * Still no change to World Map code from ZOS. Gamepad support still not possible. - Reworked "Spread over time" calculations: Don't be too restrictive for framerates 60+. - As map pins are larger now, they are made smaller on mini map. - Hide map in gamepad mode. - Scale unit pins, but not below configured minimum. - Tweak change: Multiple calls to UpdatePinsForMapSizeChange are buffered, but the update itself is not spread over time anymore. - Allow to hide floor buttons. - Show player location name in title. - Added thin shadow to title bar font. - Drag with the bottom bar, too. - Auto size pins on zoom less than 1. - Key-binds to change zoom factor while key is pressed, as suggested by @Baertram. - Again, more appearance options: Title font, size, color. 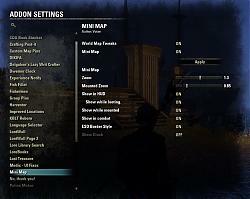 - Fixed map pin filter for Cyrodiil. - Fixed compatibility issue with Dolgubon's Lazy Writ Crafter. - Update 11 (Shadows of the Hist) ready. Having this addon installed adds an "Add-Ons" sub-menu to settings for me, while all my other addon settings are in an "Addons" sub-menu. Minimap is in the middle of my screen. It disappears when I go into cursor mode. I am not in gamepad mode. I don't see any "Fixed Position" setting, but I have tried both settings for "Lock Position & Size" with no change. I have tried just about every setting toggle that I can see. Have you tried to use the mini map stand-lone to see if there is a conflict? Yes. The minimap still vanishes as soon as I go into cursor mode, so I don't see a way to move it. @MaxWilder: I can not reproduce. Can you show me your settings? Can't drag or resize it. It's in the middle of my screen. Tried cursor mode but it just wont move. Drag does not work in gamepaad mode. Or you have "Fix Position" option enabled. I was using game pad mode. Thank you! @Marazota I think it is a timing problem with another addon re-anchoring the map windows. Do you use any theme addon? how to figure out which addon is themed and etc? e.g. DarkUI or Perfect Pixel or Better UI and so on. @Dr4Wm4N and @qbit try version 1.5.1 and tell me. The issue is fixed with async update turned off. Issue returns with it turned on. Thank you for adding this toggle. Problem fixed for me with asynchronous update off, thank you very much.